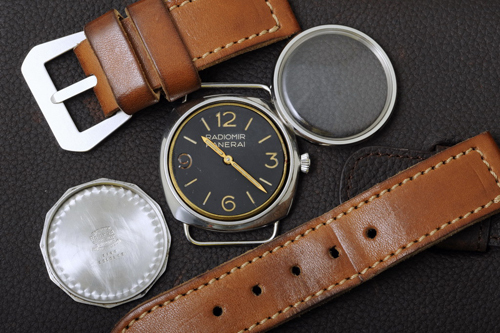 The Panerai with Reference No. 3646 are among the most collectible, military watches that survived genuine warfare. Ref. 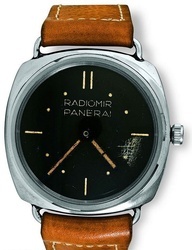 3646, or simply “3646”, was the pacesetter of the much admired Radiomir family of watches. Though not the very first Radiomir (the prestige went to Ref. 2533 in which only three prototypes were manufactured), 3646 was the most utilized model during World War II for Italian Navy (Marina Militare) and German Navy (Kriegsmarine), serving exclusive their combat swimmers. 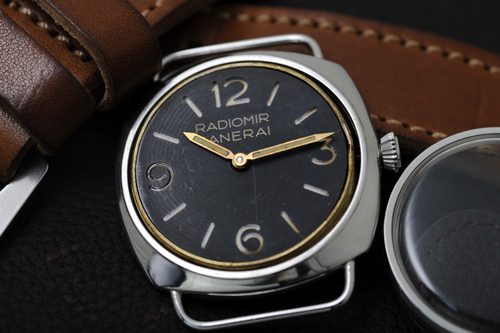 For its rarity 3646 has always been the most sorted-after vintage Panerai, the Holy Grail for Paneristi. 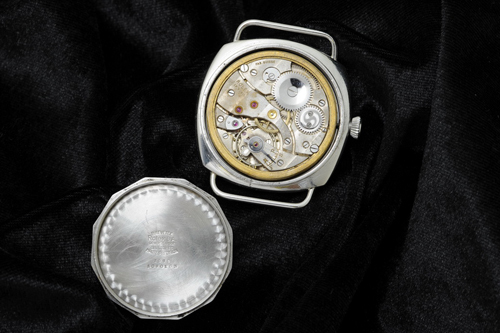 3646 is a case number assigned by Rolex, who supplied movement and also provided parts to Panerai. The 3646 has different variations during its production year (1938 – 1950’s). They were named accordingly Type A to Type G with features that varied. We are lucky to have a Type C for this review – it has almost 70 years of age but still running like a beast. To examine closely we remove the strap, caseback and also the dome Plexiglas. The 3646 Type has a very reliable core. Like many other Panerai in its earliest days, a Swiss made Rolex Calibre 618 Type 1 movement was used in this Type C. For Type C, its serial number were in the group between 1,010,091 and 1,010,374. It is believed that most Type C has been lost in battle, leaving very few existed today in good condition. 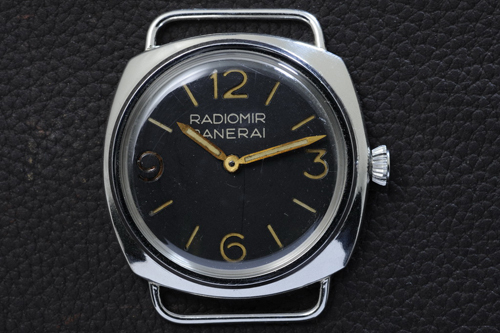 We first look into the black dial of Type C. A now standard Panerai Ordinary dial (the ”3”-“6”-“9”-“12” dial, later a signature of Panerai) for Radiomir, it has giant index dressed by brassed hands. This Type C’s index and hands has suffered a certain degree of discoloration, most notably for “9” which yellowish color almost completed turned to Amber. It is the result of ongoing decay for Radiomir paint and a series of chemical reaction that occurred in so many years. 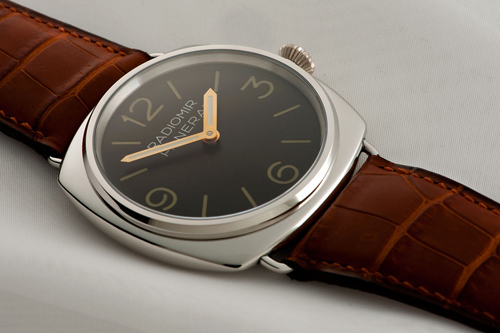 The development of discoloration, however, has impressed the fans of Panerai due to its unique pattern. It is believed not all Radiomir paint necessarily turned to different colour. We also come across other Type C which never change colour. From the “RADIOMIR PANERAI” engraved script on the dial we could tell this particular 3646 Type C served the Italian Navy. 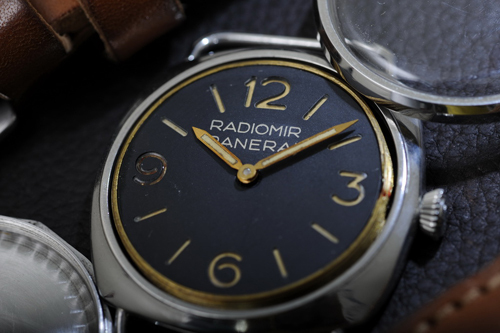 It is believed that one third of the Type C without “RADIOMIR PANERAI” all went to the German Navy. It was called the “Anonymous dial”. The reason was simple: the German wanted to keep their identities concealed if it happened that the watches has fallen into enemies’ hands. It was a special instruction given to Panerai. Generally the 3646 has a pillow-shaped case. 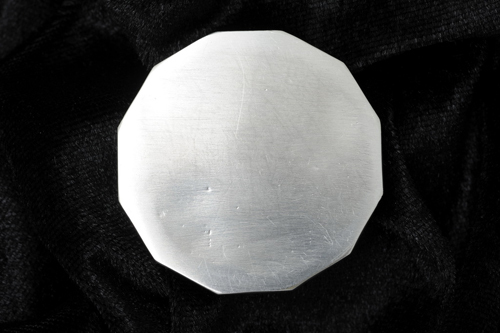 The thickness area in the middle is 6.3mm tall. The watch has a diameter of 47mm. 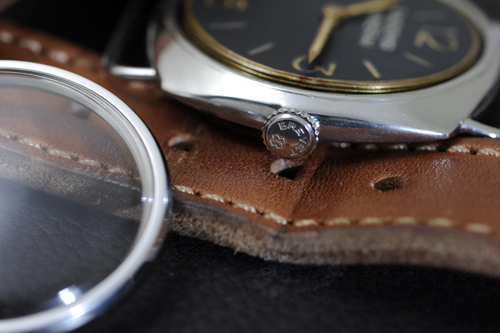 The earliest 3646 used Rolex’s “California dial”, with Roman and Arabic numbers each shaping half of the indexes, later the PANERAI Ordinary dial was adopted. As shown in the image above, the Ordinary dial is much thicker and thus taller movement retaining ring was used instead. A heavily curved Plexiglas crystal has to be installed to accommodate the taller retaining ring, so that both hands will not be obstructed. From the above image, a slightly tilted movement displays its thickness. 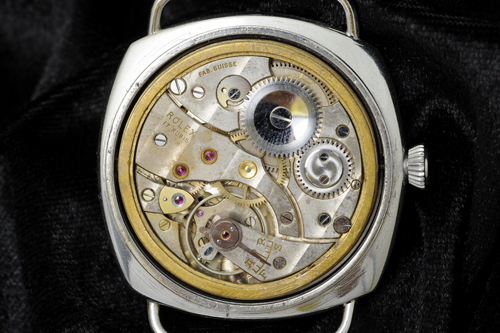 In addition, the movement is attached to the case by two screws positioned near “3” and “9”. The Type C used Rolex’ Cal. 618 Cortebert movement (Type 1), with power reserve of approximately 36 hours and protected by a 12-edged screwed caseback. On the mainspring barrel and central bridge of the movement, there wrote the scripts “FAB. SUISSE” and “ROLEX 17 RUBIS”. They are the proofs showing the watch was “fabricated in Switzerland” and used 17 Rubies as bearings. The caseback has two sides. The outside back had engraved scripts related to the wearers, most of them combat swimmer. Sometimes initials, serving year and team number were marked but not for this particular Type C.
The inside front had the signature from Rolex. For Type C it was engraved ”BREVETEE Rolex S.A. GENEVA SUISSE 31 VICTOIRES HAUTE PRECISION 3646”, with serial number mentioned in the last line. “BREVETEE” in French was “patented” meanwhile “HAUTE PRECISION” was “High class precision instrument”. These two phrases were slightly curved. 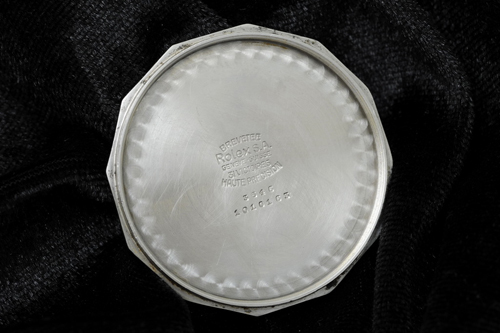 Also engraved on the tubular crown was the wording “BREVET +”, the thick “+” is the symbol for Switzerland, meaning patents obtained from the central European country. 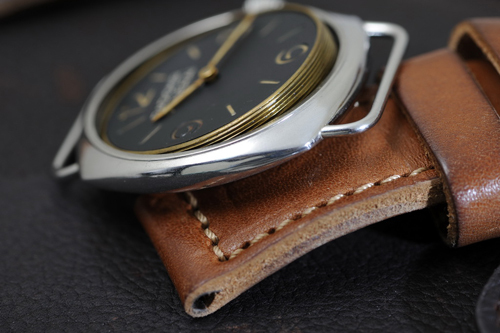 It was widely considered the PAM 21, released in Special Edition in 1997, was a tribute to 3646. It is also the first SE for Panerai. 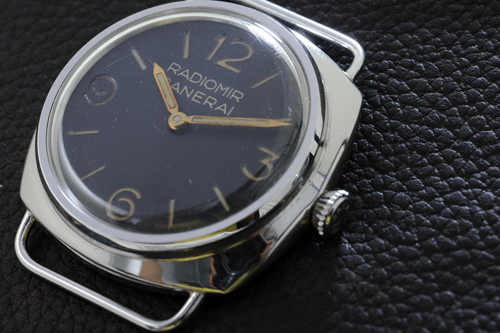 It used the same Rolex Cal 618 movement with tobacco dial written “RADIOMIR PANERAI” in the middle, only to have the pillow-shaped case replaced by platinum and hands replaced by plated gold!